Dr. Roy Smith has been providing the finest veterinary care to our cats for nearly 20 years. If you are looking for the best in care for your feline family members please consider Central Texas Cat Hospital. 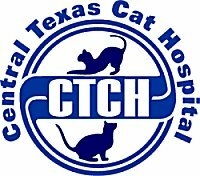 At Central Texas Cat Hospital our mission is to provide the highest level of care to cats in a nuturing environment. Participating in state and national seminars and training. Maintaining our membership in a national research and information group (Veterinary Information Network) and other professional organizations. Treating each cat as an individual while considering all options for treatment while considering the wishes and needs of the cat owner. Our full time veterinarian, Dr. Roy Brenton Smith, is licensed by the state of Texas and has over forty years experience as a veterinarian. He is nationally recognized and frequently speaks at conferences and seminars throughout the United States. For 20 years, Animal Trustees of Austin has provided safe, compassionate and affordable treatment for animals in our community regardless of their owner’s income. The dedication and commitment of its staff, donors and volunteers has made Animal Trustees exactly the sort of place that animals and the people who love them feel fortunate to find. 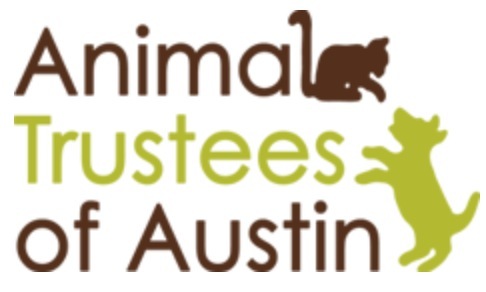 Animal Trustees of Austin serves the animals and the people of our community through compassionate, affordable treatment and respect for all. Their good work is far too broad to explain here. Click on the logo or link above to learn more. The Central Texas SPCA (Society for the Prevention of Cruelty to Animals) is a private non-euthanasia (no-kill), limited intake animal shelter. We provide shelter, food, medical care, and adoption services for homeless and abandoned dogs and cats. These services are funded solely by private donations and adoption fees. We receive no government funding and are not contracted as animal control with any local municipality or county. We accept owner release animals in addition to rescuing from local “open-door” (kill) facilities on a space available basis. 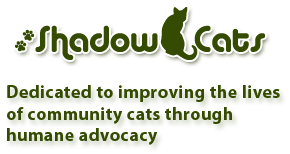 Shadow Cats is a rescue dedicated to the care of our current resident population of ill, immune compromised, injured and senior cats. We are not a shelter and do not accept animals for surrender or adoption. We promote Trap, Neuter and Return (TNR) as the most humane and effective means to control the community cat population. We provide information and resources to spay or neuter community cats. We do not trap cats for you, but we provide you with the resource information to help solve cat issues. We recommend networking with family members, church members, neighborhood associations, no kill shelters, rescue organizations whose mission is adoption in order to place social cats or kittens. Please go to our Resource page to find specific information that may help your particular situation. Austin Pets Alive! (APA!) was founded in 1997 as a private-sector support organization working with government entities, other nonprofits and the public to stop the killing of Austin's adoptable dogs and cats. We have been implementing small scale projects to help Austin's pets, pet owners, and shelters since 1997. Our leadership team has demonstrated success in nonprofit development, government, law, marketing, and fundraising, as well as veterinary medicine, animal behavior evaluation and training, and in the development of animal fostering and adoption programs. In addition, we have a wonderful volunteer organization and are always looking for additional support in this area. In 2008, APA embarked on a bold and aggressive initiative to create an Animal Resource Center. This will encompass all of APA's existing programs while creating a "safety net" for Austin's pets and their owners. APA! hopes to take on the 10,900+ animals that our city shelter is killing each year and give them a better chance at survival. (formerly Lago Vista Pet Adoption and Welfare Service, Incorporated) is a non-profit, no-kill animal shelter dedicated to preventing animal suffering, rescuing and caring for stray and abandoned dogs and cats and finding homes for these animals, educating the public about responsible pet ownership, and encouraging pet owners to spay and neuter their animals. We are NOT the average shelter and refuse to participate in the killing of hundreds of healthy, homeless animals that takes place every 60 seconds in America. We are an all volunteer organization, and it has been your continued support and compassion that has allowed us to manage animal rescue challenges, operate and maintain our shelter, and facilitate hundreds of adoptions. Please call 512-267-6876 to make an appointment on a weekday or weekend. Pet Helpers is a non-profit animal welfare organization, whose goal is to reduce the number of innocent animals being destroyed each year, by placing these homeless animals in permanent, loving homes. Pet Helpers is staffed by volunteers who care about the plight of all homeless pets. Founded on the belief that all life should be valued and treated with dignity and respect, Austin Siamese Rescue, Inc. has a long-term commitment to responsible rescue, rehabilitation and the re-homing of Siamese cats and their non-Siamese companions in the Central Texas area. Austin Siamese Rescue, Inc. is a 501(c)(3) non-profit organization, formerly the Austin Branch of Texas Siamese Rescue. We focus on the 14 breeds of the Royal Thai Family, including Siamese, Balinese, Javanese, Oriental Shorthairs and Longhairs, Birmans, Burmese, Himalayans, Ocicats, Ragdolls, Snowshoes, and Tonkinese. All of the cats fostered in Austin are cared for in private homes by individuals who dedicate their spare time to this effort. Serving our community since 1952, the Austin Humane Society (AHS) is the longest standing no-kill shelter in Austin. AHS transforms the lives of animals and the people who love them through life-saving programs that find animals homes, serve animals and people in times of crisis, prevent future homelessness though spay and neuter, and engage the community to be a part of the solution. Over the past year, AHS has unleashed hope for over 11,000 animals thanks to the generosity of our donors. The Humane Society, located at 124 West Anderson Lane, Austin, TX, has been caring for animals for over sixty years and operates one of the most progressive animal shelters in Texas. An inclusive list of local rescuers of both dogs and cats, shelters and rescue. Texas Humane Heroes, formerly the Humane Society of Williamson County and the CenTex Humane Society Second Chance Adoption Center, is a not-for-profit 501(c)(3) organization. Serving two locations in the Greater Austin Metropolitan Area and Killeen, Texas. Adoption centers are located in the Greater Austin Metropolitan area and Killeen/Fort Hood/Copperas Cove/Harker Heights area. Humane Heroes is 100% funded by donations, grants, and modest fees for services. Texas Humane Heroes receives no government funding. Austin Animal Center runs the largest no-kill animal shelter in the United States, providing shelter to more than 18,000 animals each year and animal protection services to all of Austin and Travis County. The Austin Animal Center is an open-intake facility where lost and surrendered animals from all of Travis County in need of shelter are accepted regardless of age, health, species or breed. The goal of the Austin Animal Center is to place all adoptable animals in forever homes. If you have lost or found a pet in Austin, TX you can check here for more information. Search & Shop to Support Us! Each an individual... each a special soul... each with love to share..
TJR is financially self-supporting and we ask for an adoption fee from those who adopt. Tuxedo Junction Rescue, Inc. is a 501(c)(3) non-profit charity. and we follow up adoptions for at least a year. We reserve the right to refuse any applicant for any reason. Make a tax-deductible donation or sponsor a cat with credit card or check! Click the PayPal button to donate any amount using PayPal or your credit card. You can make it a one time donation or a monthly donation of any amount you choose!